As wedding photographers, we LOVE our job. It’s just a given, I mean… people who don’t love weddings don’t shoot them, right? So when we find couples that not only love our work, but love each other in that movie kind of way, we are ecstatic! From the moment I met Narin and Daniel I knew that their Stockholm wedding would be of the very epic kind and I wasn’t wrong. Even when we did their pre-wedding shoot (which you can see by clicking here) it was so obvious that these two adore each other. One of the perks of the job is witnessing this love take the marriage journey and spread happiness and love with everyone in the vicinity. When people see couples in wedding attire they automatically smile and congratulate the couple and that’s one of the best parts of the day for me as a photographer, especially living in a city that’s actually quite introverted when it comes to talking with strangers. For people that had told me that they don’t usually kiss in public, they were anything but shy on their wedding day. We’re talking silly faces, gangster poses and full on, epic high fives as well as completely open displays of affection. It was amazing. The say started with Narin and her girls as she got ready at Browallshoff in Stockholms Östermalm area. 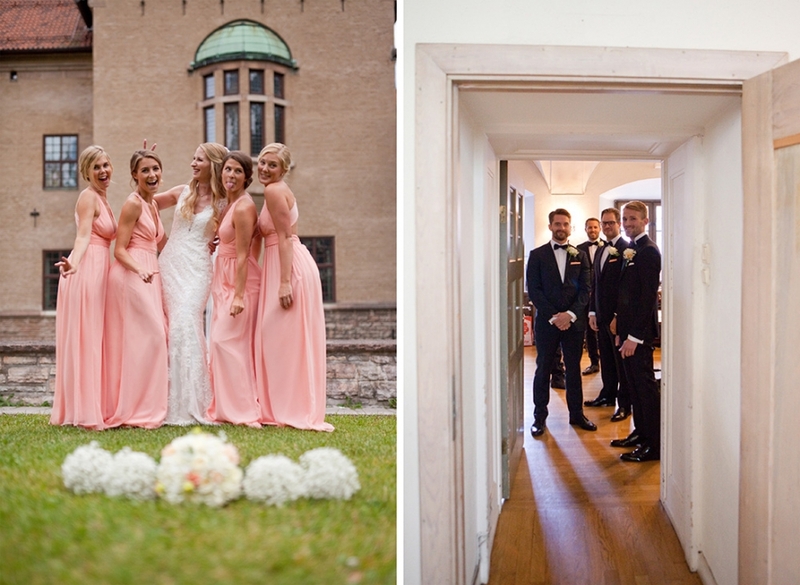 They had decided to be non-traditional in terms of Swedish traditions and NOT see each other before the Ceremony, which I can say was the BEST choice. The look on Daniels face when his Bride arrives at Syster och Bror is just priceless. You actually hear the audible gasps from guests and Daniels complete awe at Narin and her insane gorgeousness. I feel very strongly that this moment is one of the most emotionally fueled moments of the whole day, and it certainly lead the way for some tears of happiness from both Narin and Daniel and even their guests. Their emotion and love for each other was infectious. Enough of me rambling, though, here are some photos from their big day which actually went of without a single hitch. They had thought of everything from entertainment for their guests as I took them off to have their portrait session to the tiniest details with their decorations for their Reception. I was also really impressed with the dedicated friends they chose to have as their Maids of Honour and Best Men as everything was on pointe thanks to their organisation and help. It was a lovely, unforgettable experience to be their stockholm wedding photographer and I still look back on these photos and think how proud I was to be there and how wonderful their day must have felt for them. Thanks Narin and Daniel, for being you.